Mobile advertising gained steam in Q4 thanks to increased interest from advertisers and consumers during the holidays, according to recent data and reports from several mobile advertising platforms. As consumers turned to their phones and tablets more often during the holidays — and as they received new devices as gifts — advertisers took advantage during the last part of the year. Overall, analysts are bullish about the future of mobile advertising, with Gartner predicting that global ad revenues will reach $11 billion in 2013 and $24.5 billion in 2016. eMarketer raised its U.S. mobile ad spending forecast in December, because of the success of Facebook’s mobile ad revenues. During Facebook’s earnings report in October, the company announced that 14% of its revenue during the third quarter came from mobile, about $150 million. While there are still concerns about measurement and the ability to be creative with the format, mobile RTB providers are seeing increased demand from advertisers who want to supplement their traditional ad buys with targeted, location-based mobile RTB buys. Data from Adfonic backs this up, as the company reported an important shift in the RTB space in October 2012: more mobile RTB requests than non-RTB requests. In September, 46% of requests on the Adfonic platform were for mobile RTB, rising to 60% in October. Additionally, Adfonic found that CTRs and eCPMs were much higher for RTB, compared to non-RTB metrics: 48% and 64% higher, respectively. Mobile ad management platform MoPub reported that eCPMs rose during the quarter — Elain Szu, director of product marketing for MoPub, said they have been on the rise since Q2 2012 — and stayed high into early January. This also translated to CTRs, with RTB ad performance sticking around even in the first week of January, compared to the rest of the holiday season, she said. While these mobile ad tech companies agree on the growth, there are some differences when it comes to the type of ads that advertisers are using for mobile outreach. Both Adfonic and Nexage highlighted the strength of rich media ads for RTB, while MoPub isn’t as convinced about its performance relative to the higher prices. 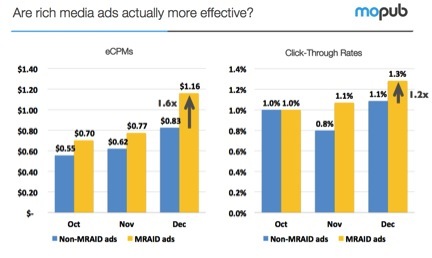 However, CTRs for rich media ads on MoPub’s RTB network were 1.2x higher than non-rich media ads, but their eCPMs were only 1.6x higher, and increasing. Yet, Adfonic found that rich media ads via non-RTB saw a 65% uplift in CTRs compared to non-rich media with non-RTB. Rich media on mobile RTB were up an additional 53% from rich media via RTB. There were also some concerns that over the holidays, advertisers would want more guaranteed buys and that publishers wouldn’t have as many problems selling inventory, leaving little room for RTB. But that didn’t seem to be the case on mobile. During the holidays, Milligan said, there were still a lot of guaranteed buys from advertisers, but the opportunity for them to target their campaigns with timing and location via mobile was a good way to make efficient use of ad dollars. On the publisher side, with higher eCPMs and increasing interest, they started to also see RTB as a compelling way to add to their business, Szu added. The mobile RTB space is different than desktop in that its location-specific targeting can provide value to advertisers who want real-time interactions with consumers. If that demand continues to raise the rates and quality of ads, publishers may be more willing to offer RTB as a more strategic element down the line.